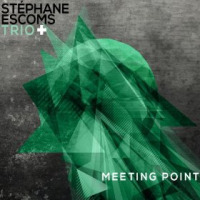 Pianst/composer Stéphane Escoms fronts a versatile trio on his self-produced sophomore album Meeting Point. The French native has studied with the legendary Cuban pianist Chucho Valdes and Bulgarian pianist Mario Stantchev. A prize-winning musician, Escoms has crossed borders and genres frequently in this early phase of his musical career. Where he has intersected and absorbed influences becomes apparent in the shading of these compositions. Billed as ..."Trio +," Meeting Point features five guest artists on various tracks and the collection includes dual versions of three pieces. With the exception of "K.M.A." and its remixed version, the compositions are Escom originals. Much of the music is solidly rooted in the mainstream piano trio tradition with occasional excursions into more remote territory. The aforementioned Stantchev penned the opener, "K.M.A." With its briskly entertaining retro-strut, it is a piece that Escom often uses as a fanciful audience warm-up in performances. "Marrakech" leads with bassist Jeremi Lirola before introducing guitarist Anthony Winzenrieth who comingles the dual influences of the Middle-East and old-world Spain. Though not explicitly stated, one would assume that "Mario" is dedicated to Escoms' mentor, Stantchev. Lirola again sets the stage reaching down for a rich resonant sound before drummer Francesco Rees picks up the pace and leads Escom to the front. On "Pick-a-Boo" Rees ignites the piece from the outset and Escoms and Lirola get the chance to more forcefully show their improvisational skills and loosen up the overall tenor of the album. "Rajan's Song" once again with a strong Middle-Eastern foundationfeatures Indian flautist G.S. Rajan who sets the cultural tone before allowing the piece to slip back into more standard balladry. A highlight of the collection"Yellow fruit"features tenor saxophonist Damien Prudhomme whose soulful and fluid lines add yet another dimension to Meeting Point. Escoms' lavish harmonic and rhythmic arrangements serve as a jumping off point for many of the fine solos. The closing pieces are alternate versions of "Mario"a duet featuring Escoms and UK cellist Danny Keane"Marrakech," with the core trio only, and "K.M.A. Remix" with some electronic vocalization. The latter piece is frankly a bit out of place amongst all the balladry but it's a small quibble. The musicians in Escoms' charge listen carefully to each other and the overall collection is more often than not reminiscent of pianist Bill Evans style of mid-tempo balladry. Meeting Point features first rate playing and interesting compositions and the further growth of these artists will be welcome. Track Listing: K.M.A. ; Marrakech; Mario; Pick-A-Boo; Rajan's Song; Yellow Fruit; Market Under The Rain; Ausencia; Mario (Duet version); Marrakech (Trio version); K.M.A. Remix. Personnel: Stéphane Escoms: piano; Jeremi Lirola: double bass; Francesco Rees: drums; Anthony Winzenrieth: guitar (2); G.S. Rajan: bansuri flute (5); Damien Prudhomme: saxophone (6); Maria Tejada: vocal (8); Danny Keane: cello (10).